Microwaves have wavelengths that can be measured in centimeters! 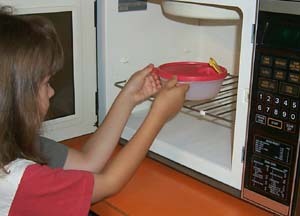 The longer microwaves, those closer to a foot in length, are the waves which heat our food in a microwave oven. Microwaves are good for transmitting information from one place to another because microwave energy can penetrate haze, light rain and snow, clouds, and smoke. Shorter microwaves are used in remote sensing. These microwaves are used for radar like the doppler radar used in weather forecasts. Microwaves, used for radar, are just a few inches long. 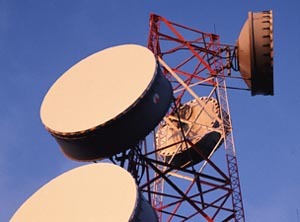 This microwave tower can transmit information like telephone calls and computer data from one city to another.